Yoda is shrouded in mystery, but we’ve got him pegged. There are many species in the Star Wars universe — Humans, Hutts, Wookiees, Jawas, Rancors, and the Tusken (soon to be Las Vegas) Raider, to name a few. Yoda, though, nobody knows about. 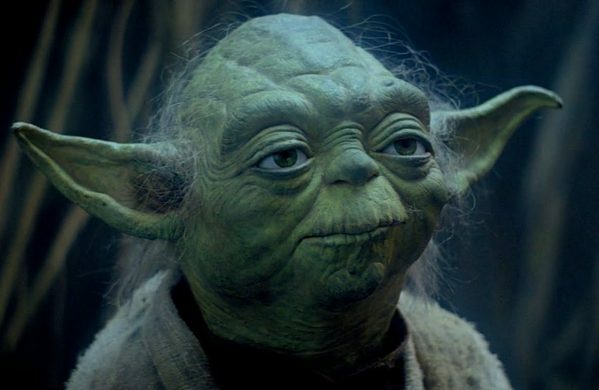 The austere website Wookieepedia states that Yoda belongs to “Yoda’s species,” one that is “shrouded in mystery.” While such an enigmatic backstory only helps to grow one’s legend as an impossibly wise mystic, I think it’s pretty clear that Yoda is an Italian-American. For starters, Yoda looks the part. He’s short. Even the Ewoks, the Irish of the Star Wars’ universe, are significantly taller. It’s rumored that he became such a master of the force after tiring of not being able to reach anything on a shelf. And you have the big ears, in which reside tufts of unruly white hair. Images of beloved Italian-Americans, like Danny DeVito, are reflected in Yoda. His speech. Inverting the syntax? Go to a First Holy Communion reception in South Philadelphia and tell me you don’t hear much worse. Offering vague, obscure lessons hidden in metaphor? Reminds me of my Little League coach, Mr. Vaccarri, who’d say, “The bird who smacks the ground hardly gets the interest seed.” I never learned what that meant, but I’m sure it contains multitudes. His name ends in a vowel. This is pretty self-explanatory. Finally, and perhaps most convincingly, he lived the Dagobah system, on a run-down, forgotten planet that spawned the cultural epitaph that we know today. Cries of “Dago? Bah!” chased Italian-Americans to that swampy exile for millennia. As a member of Yoda’s species, I feel a sense of pride. I hope to one day can master control of the force, and no longer stand on chairs to reach the cereal bowls.